Use two paper plates to create a pocket which turns into an interactive puppet design! 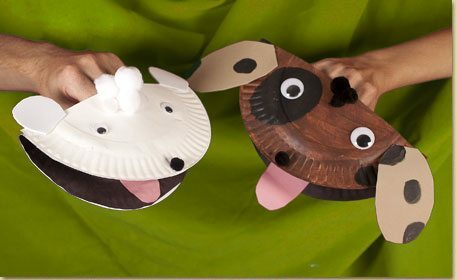 Watch this video to see the paper plate puppet craft made in action! For basic photo instructions for this craft, follow along with our frog craft, but make slight alterations in color and decorations to make it a dog instead of a frog!